Shared Inspiration by Jill Jacobsen: Fresh Cuts "Sneak Peek"
I love the new Fresh Cuts stamp set and cards. The cards come die cut so all you do is punch out the center. I stamped the main image on Groovy Guava in Versamark and embossed it with Orange Sherbet EP from Sparkle n Sprinkle, it shimmers. I adhered it to the inside of the card with dimensionals. 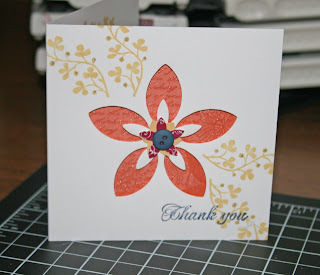 I stamped the center flower with Purely Pomegranate. I punched it out with the flower punch and added a Navy button. The sprigs were stamped with So Saffron. Thank you is stamped with Night of Navy.